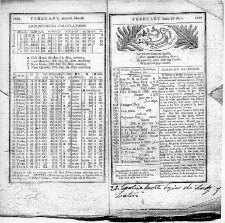 An almanac, in its simplest form, is a book containing a calendar that includes notations for holidays and holy days, as well as astronomical information such as the rising and setting of the sun and moon, the phases of the moon and high and low tides. According to the Encyclopedia of Ephemera, the first printed almanac was published in Vienna in 1457 and the first American almanac, Almanack Calculated for New England, was published in 1639 by William Pierce in Cambridge, Massachusetts. 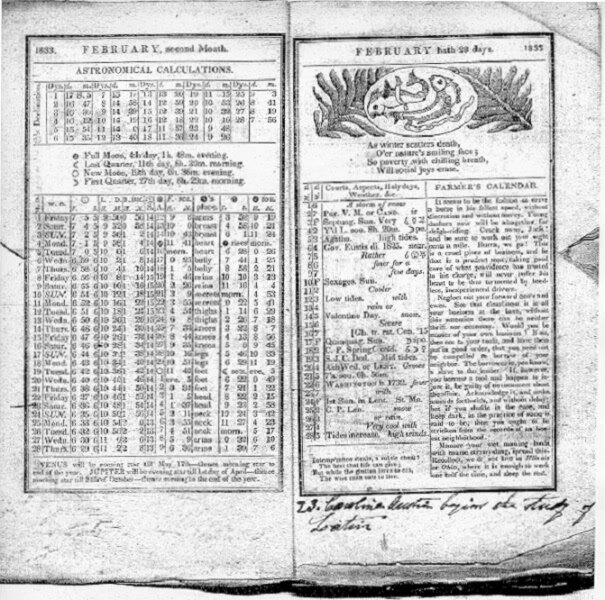 Generally, almanacs were printed on what was considered cheap paper. However, cheap rag-based paper being better than wood pulp-based paper, the pre-1860s almanacs are in surprisingly good shape despite the obvious use they received. Some even have strings in the upper-left-hand corner, indicating they were hung on nails for easy consultation. While some of the almanacs in this collection are slightly smaller than a sheet of typing paper, most are even smaller, often small enough to fit in a man's back pocket.